Land of the Lost — the wonderfully cheesy 1970’s Saturday morning show — has been turned into a major motion picture starring Will Ferrell that opens in theaters on June 5, 2009. NBC Universal has launched a free game on the App Store to help build interest for the movie. Escape from the Sleestak temple before you're served as stew! Land of the Lost is a new comedy that tells the story of Dr. Rick Marshall who, along with a survivalist and his research assistant, get sucked into a space-time vortex and end up in an alternate universe populated by dinosaurs and other fantastic creatures — including a race of violent lizard-men called Sleestaks and a friendly primate called Chaka. In the iPhone and iPod game, Land of the Lost: Crystal Adventure, Rick finds himself trapped in the Sleestak temple, where he must overcome pits and traps, solving puzzles by pushing blocks, building bridges and navigating around obstacles to escape. 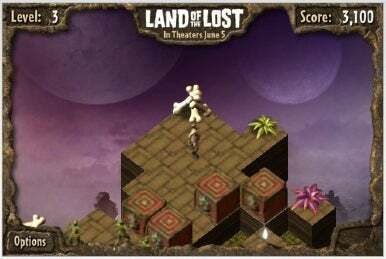 The game features 25 levels, photos, trailers and sound bytes from the movie, the ability to replay any completed level, and a local scoreboard.